← If they’re willing to spam you, think twice. No, think three times. Well yeah, why *can’t* public transit be free? Of course, it comes down to economics. But I’m reminded of a couple of stories. A corporation needs a new accountant, and the VP of HR does the interviewing. In comes the first candidate. “What is this, a joke? I don’t need to work with simpletons!” And the first candidate walks out. In comes the second candidate. In comes the third candidate. Second was the delightful scene in the film “Dave” with Bill Pullman where a presidential stand-in rewrites the budget with the help of an accountant buddy of his to save a previously-vetoed homeless shelter that the (real) First Lady was supporting. Now, that’s fiction – but you can’t tell me that if a room full of people of good will sat down with our national budget and cut out the fat and the folly and the inhumane bulldust, you couldn’t fund all sorts of useful and needful infrastructure and social programs like transportation and education. I simply refuse to believe it. The money is there, it’s just that so much of it is being redirected toward pork and waste and death and destruction, and the good will isn’t, because everyone wants to belly up to the public trough. I got thinking about this today because of a recent article at the BBC reporting on a three-day free transit window in Paris (to reduce pollution), and one at The Atlantic which asks and explores the issue of free public trasnsporation. When I was at the University of Utah in 1974, I began my experience as a freelance translator, and one of the pro-bono jobs I did was translating certain documents from Italian in to English for the benefit of Utah State Representative Sam Taylor regarding a free transit experiment in Rome. His obituary from the year 2000 illustrates that he was a controversial figure; in retrospect, I’m not sure if Representative Taylor was actually for or against the idea of free transit. In 1970, Mr. Taylor was elected to the Utah House of Representatives, where he served until 1986. 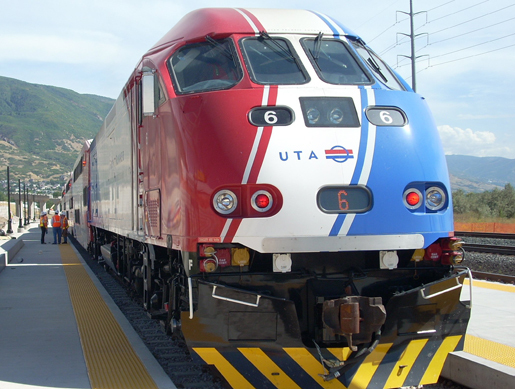 In 1973, he passed the Transit Act, which created the Utah Transit Authority. In 1993, Mr. Taylor was appointed to the transit authority’s board and served two terms. He was often the sole voice of dissent on UTA board decisions and in 1995, while a board member, he filed a lawsuit against UTA to try to stop construction of Salt Lake County light rail. Mr. Taylor was recognized in 1997 by the Amalgamated Transit Union and the AFL-CIO for “leadership and untiring support for the men and women who make UTA go.” Mr. Taylor left his position on the transit board last year. 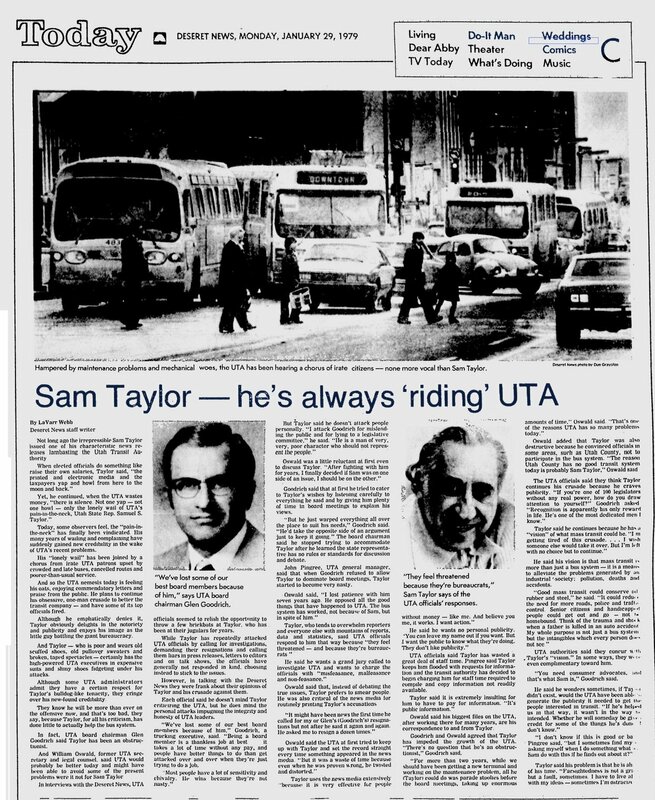 The article below from the Deseret News is published from the Utah Transit Authority’s slant, but it does point out that Sam was an activist who was looking out for the rider rather than the corporation (click the image to read in full size). Well, Light Rail and later the FrontRunner heavy rail system ultimately went through and continues to be expanded. It was needful and remains useful, but the UTA still struggles to increase ridership. From my extensive travels in Europe, I can tell you that a good and reliable mass transit system is a huge blessing for people from all economic strata. But here in America, where people are wedded to their cars, it’s constantly an uphill battle. That experiment in Rome? Well, it didn’t work out so positively, but I give them props for trying. The earliest urban experiment in free public transit took place in Rome in the early 1970s. The city, plagued by unbearable traffic congestion, tried making its public buses free. At first, many passengers were confused: “There must be a trick,” a 62-year-old Roman carpenter told The New York Times as he boarded one bus. Then riders grew irritable. One “woman commuter” predicted that “swarms of kids and mixed-up people will ride around all day just because it doesn’t cost anything.” Romans couldn’t be bothered to ditch their cars—the buses were only half-full during the mid-day rush hour, “when hundreds of thousands battle their way home for a plate of spaghetti.” Six months after the failed, costly experiment, a cash-strapped Rome reinstated its fare system. If public transit is to succeed, it must be both convenient and affordable. A monthly pass which includes Trax and buses in Salt Lake runs $83.00, with 50% reduction for seniors and the disabled. Add another $100 (or $50) if you want to use the FrontRunner heavy rail. That’s not overly burdensome for the average wage earner, but the main problem in this area is that it’s not convenient if you don’t live near a bus line, and getting from one place to another can double your commute time as opposed to driving. mostly due to the time getting to a bus stop and the wait for transfers. In the end, I am left wondering what the effect would be if public transit were free altogether, always. I’m not offering any suggestions on how to fund this, just wondering what the overall impact would be. In the meantime, follow this link to see how your city’s public transit system stacks up. This entry was posted in Transportation and tagged Buses, Free Bus Experiment, Light Rail, public transport, Rome, Sam Taylor, UTA, Utah, Utah Transit Authority. Bookmark the permalink. The funny thing is that it is a given in the DC area (and maybe everywhere in the US; I dunno) that a new Metro station will bring more car traffic to the area. That’s why Georgetown refused to get one. The traffic in Georgetown is already horrendous and I hate to think of it getting worse. Aren’t there US systems that provide free public transit? I thought I’d heard of some, but I’m not energetic enough to check that out.